Makeup brands on social media may not be as product oriented as retail brands but neither are they exceptional in their social media strategies. While some of them are doing a great job by promoting blogger reviews, running contests and creating branded content, others are merely using social media as another platform to promote their offers and products. In addition to pushing their products, these brands are also luring their target market with cosmetic hampers. They should, instead, try and pop in some innovation into their campaigns to effectively boost their branding. When everyone is doing the same, what makes your brand stand out from the crowd? I have studied 10 brands within a 3 month period between 15th November 2013 to 15th February 2014. On Facebook, most makeup brands are scattered between 500K to 3.5 million fans. Maybelline India has the most number of fans with a little over 3.2 million. It also has a satisfactory growth rate of 10.4%. The brands are growing at a decent rate with a range of upto 25%. Oriflame India has the highest growth at 22%. However, as compared to the other sectors, these growth rates are still quite low. This is a clear indicator that makeup brands need to spruce up their brand activities else their growth will remain stagnant on social media. In fact, Colorbar India has a growth rate of only 3%, which should be a cause of alarm for the brand manager. Ponds India is placed even lower, at 0.04% growth, even though it boasts a fan following above 1 million. On Twitter, only 3 brands cross the 10K+ mark. L’Oreal Paris India is leading with 18K+ followers, followed by Revlon India with 16K+ followres and Oriflame India with 12K+ followers. Unlike Facebook, brands enjoy a better growth on Twitter, ranging upto 65%. Lakme India has the highest growth at 64% while Olay India has the lowest growth at 6.5%. Interestingly, all brands above the 10K+ followers group have a growth rate below 30%. 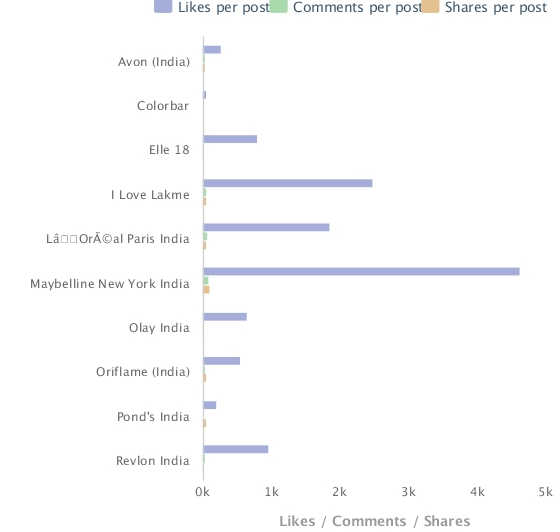 Maybelline New York India had the highest number of posts in the last 90 days. The brand has posted 477 updates which equals to an average of 5.3 posts per day. 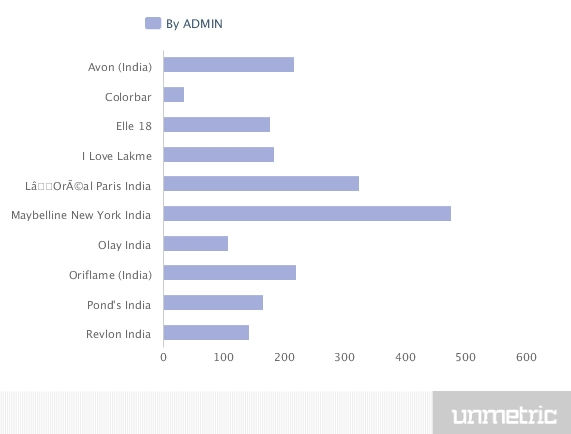 Avon India, Oriflame and Lakme share anywhere between 2-3 post updates per day on an average. Colorbar had the least number of posts (35) which means it had skipped posting on several days. Therefore, it has very low engagement as well. According to the Unmetric platform, 8,817 new posts were written across 10 makeup brands which averages to 9.5 posts per day. 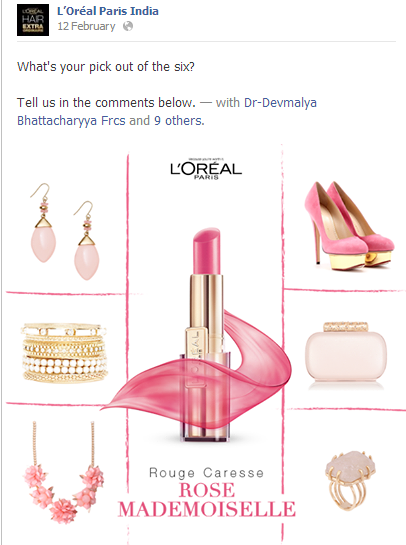 L’Oreal Paris throws in interactive posts once in a while, inviting answers. These updates are coupled with well-designed images and tend to increase engagement. 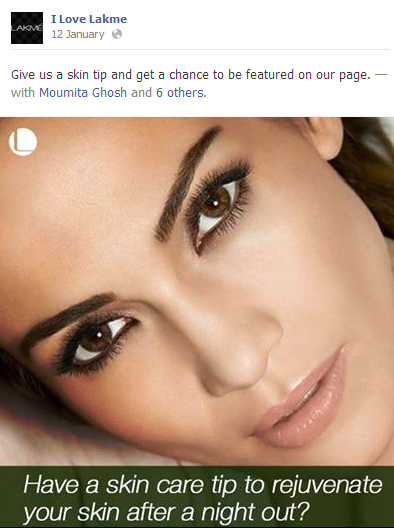 Lakme has taken the interactive level further ahead by inviting makeup tips from its fans. Since makeup brands thrive on reviews, some brands post blog reviews on their social media accounts while some highlight reviews from their sites. This is a good conversation starter for makeup brands on Facebook and Twitter. 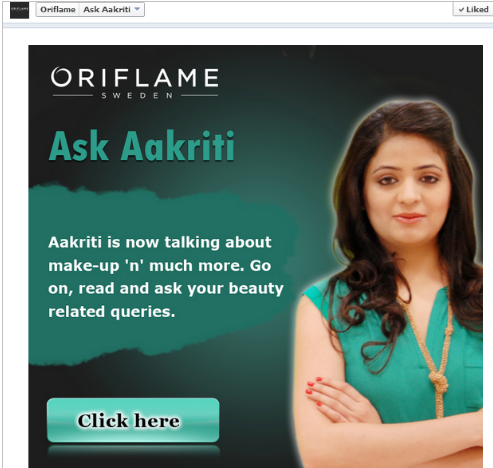 Oriflame has an application called Ask Aakriti which redirects users to a site where they can ask the brand questions which are answered by Oriflame. They do this by portraying a blogger who answers the questions. 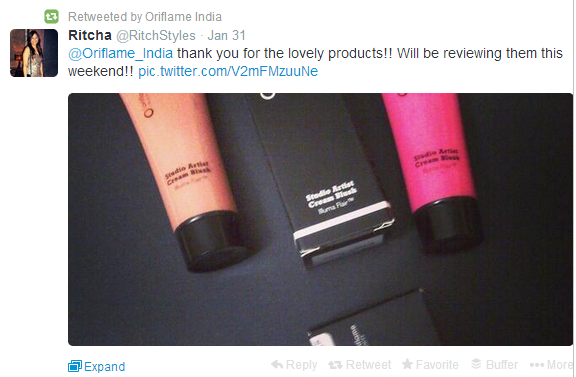 Oriflame also re-tweets blogger tweets to spread word about the reviews of its products. 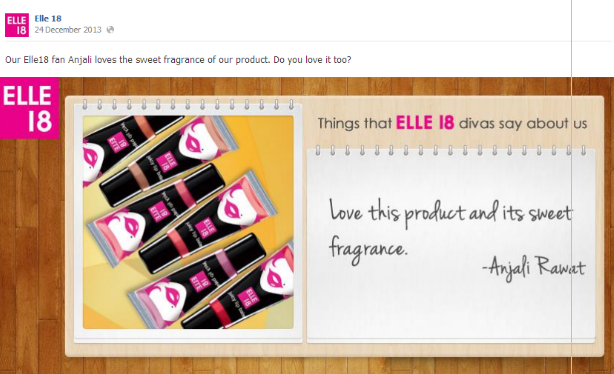 Other than blogger reviews, Elle18 also posts customer testimonials in a fun way on their Facebook timeline. Avon India uses its Facebook and Twitter accounts for various news and announcements along with makeup tips and product promotion. Store launches and event announcements are updated. They have coupled it with interesting statistics. 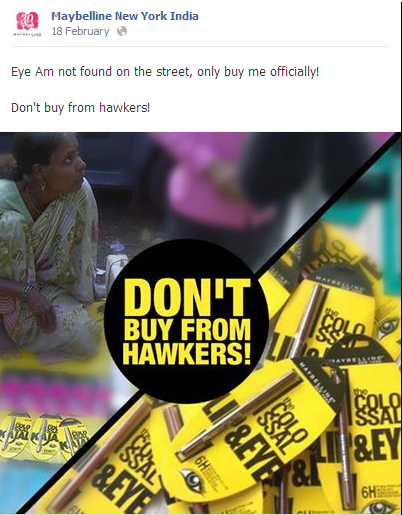 Even Olay India announced and promoted #SwapToOlay on Facebook and Twitter. 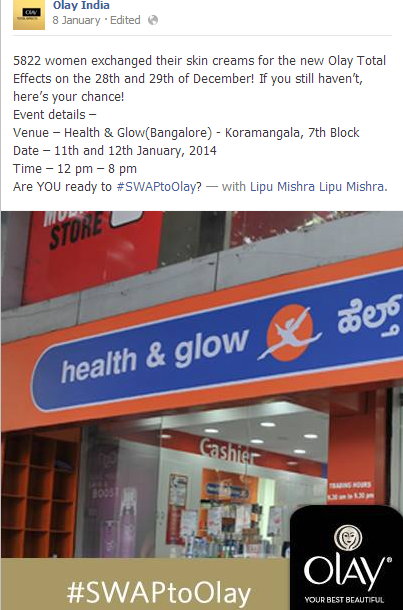 Such offline events when integrated with online media help to boost the brand image. 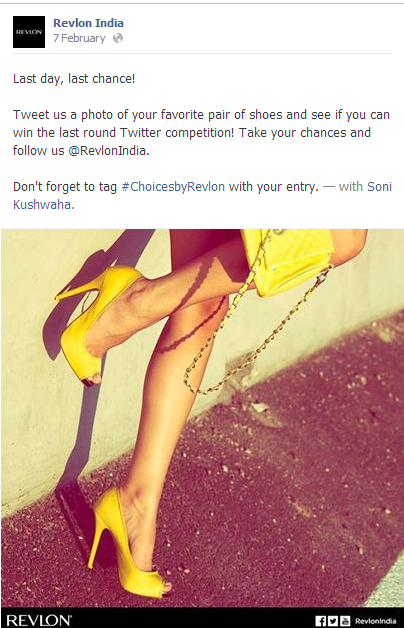 Revlon India is a great example of branded content. It has its logo and other social media property icons on most post updates. Quirky post updates to product promotions- all flash these icons, making it easier for fans to track them on social media. It also makes sure that at least one post, within a couple of days, is integrated with its Twitter activities. Using consistent hash-tags and designs are great for social media marketing. It shows that the brand is being handled by a seasoned professional. Elle18 too has some amazing branded content, well designed and targeted at their user group. 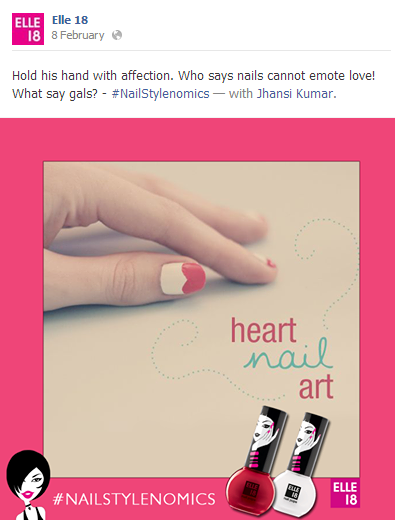 They also use effective hash-tags like #NailStylenomics. 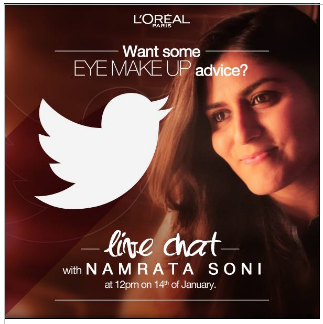 L’Oreal Paris did a Twitter chat with Namrata Soni, a makeup expert with hash-tag #GetMagiqueEyes. This is an interesting strategy for the brand to follow, considering it initiates double engagement in a short period. 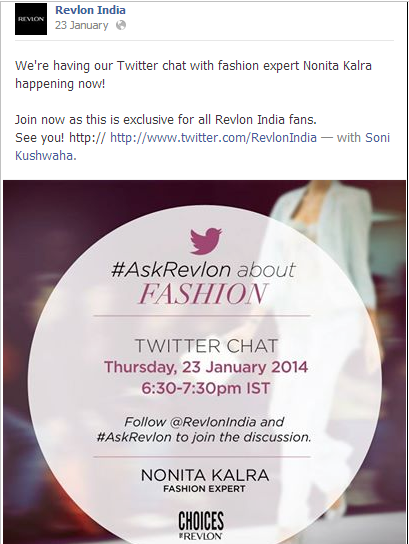 Revlon has live chats too, on Twitter. However the brand does it differently. It has different experts from all walks of life on board. 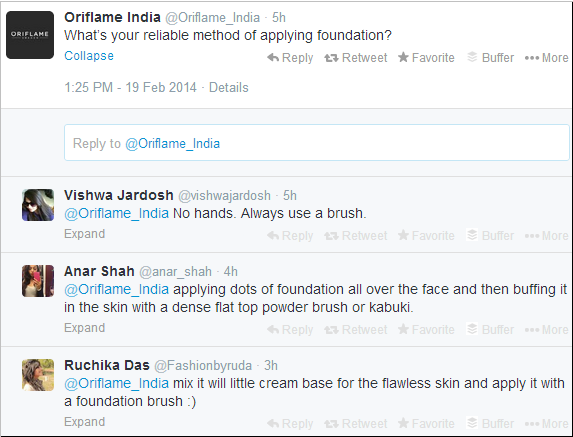 Oriflame pops up questions on its handle. These are simple makeup related questions which are open ended and make an attempt to interact with users. Makeup brands and blogger activities are a perfect match and if a brand promotes this on social media, it can be very effective as a marketing strategy. While brands usually tend to market their products directly, there is huge untapped potential in indirect marketing. Social media is not for merely posting images of products. 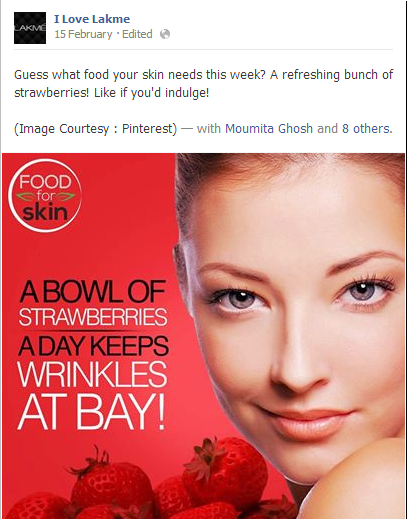 Lakme, for instance, posted a skin care tip but in turn created a brand recall for its strawberry facewash. Oriflame too did this when it launched the online catalogue of its products. It ran the contest- #OnlineShopoholic. However, going completely off product promotion is a wrong strategy too. 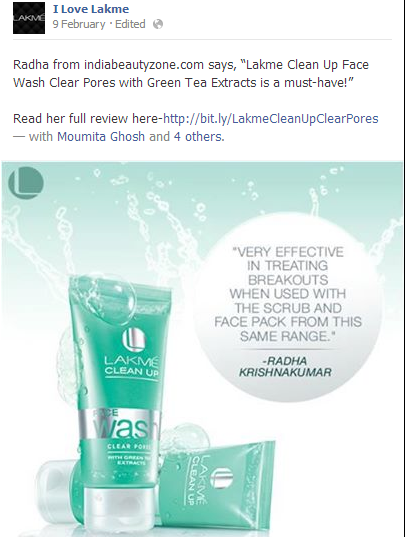 For instance, Ponds India hardly promotes its product. There is no content strategy in place. 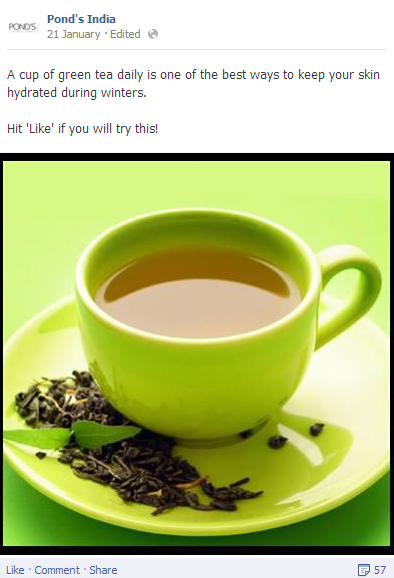 They offer tips one after the other which is not helping the brand maximize its potential on social media. Even on Twitter, it posts similar updates as on Facebook. 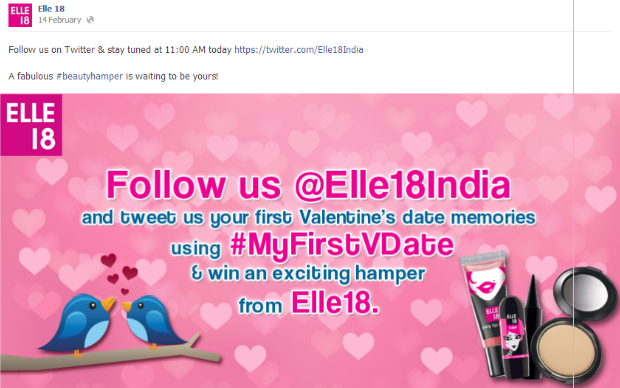 Makeup brands are running micro contests on Twitter and Facebook all the time. 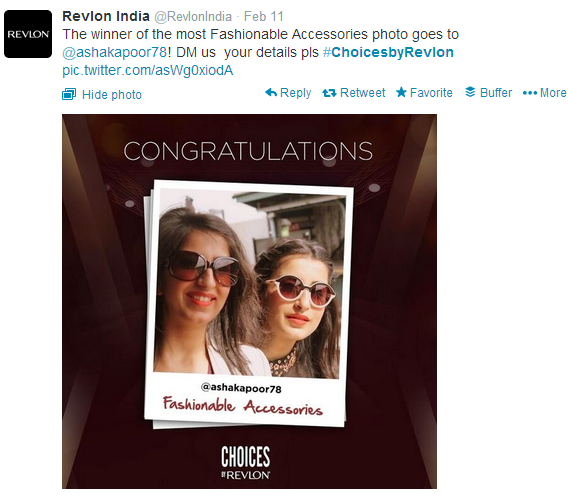 However, one of the most unique contests was run by Revlon India, called #ChoicesbyRevlon. A series of pictures needed to be posted by users about shoes, accessories, gadgets etc. and in each category a winner was selected. This was an impressive campaign by Revlon India as it could get any girl excited. 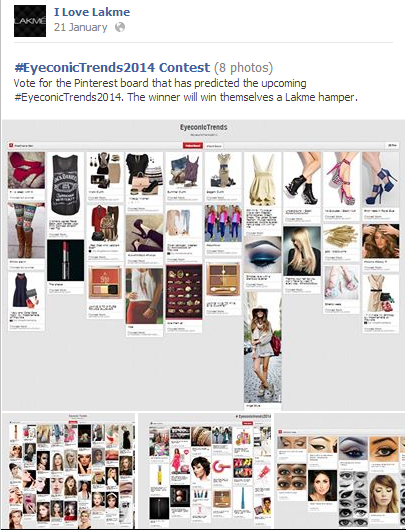 Also, Elle18 and Lakme deserve special mention for integrating their Twitter and Pinterest contests with Facebook. Not many brands are doing this currently. This is a great way of spreading word of your contests. Maybelline has been known for its innovative social media campaigns and activities. I found their February pink-themed timeline a very interesting concept. 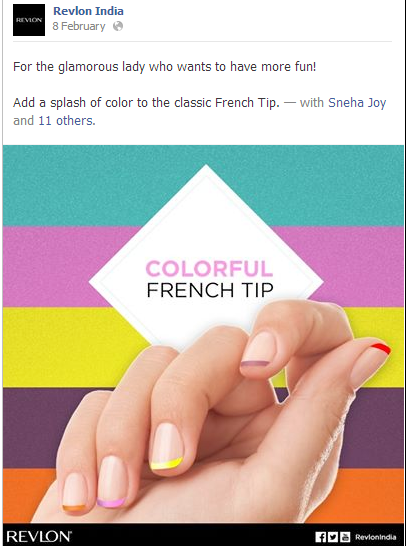 It is a colour girls usually instantly connect to and the brand is also receiving a lot of interaction for this campaign. Also, a very interesting post on social awareness was posted by the brand. Although it was outside my study period, it deserves a mention. L’Oreal Paris has the maximum number of applications. However, simply installing an application does not help a brand unless they promote it and get their fans to use it. Though it currently has 22 applications, the number of total monthly users is only 589. Lakme, on the other hand, has 16 applications and has the highest number of monthly users at 33K+. It is intriguing to know that makeup brands on an average have 13 applications. This is a big figure as compared to other sectors. If there are a larger number of people talking about a brand then it can be an indication of better engagement with fans. This is summed up in Facebook’s People Talking About This (PTAT) metric. 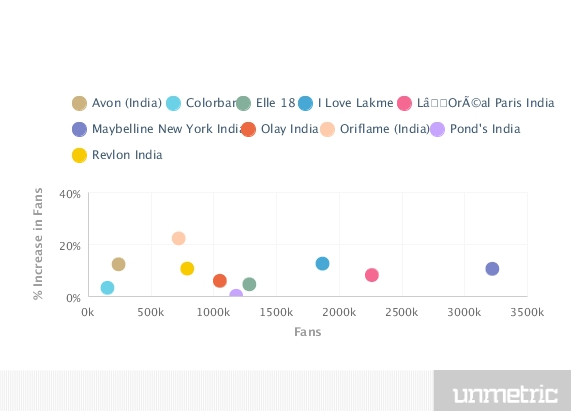 While Maybelline India has the most fans, it has only 3.1% people talking about it. On the other hand, Avon India has a much smaller fan base but it has an 8.2% PTAT score. 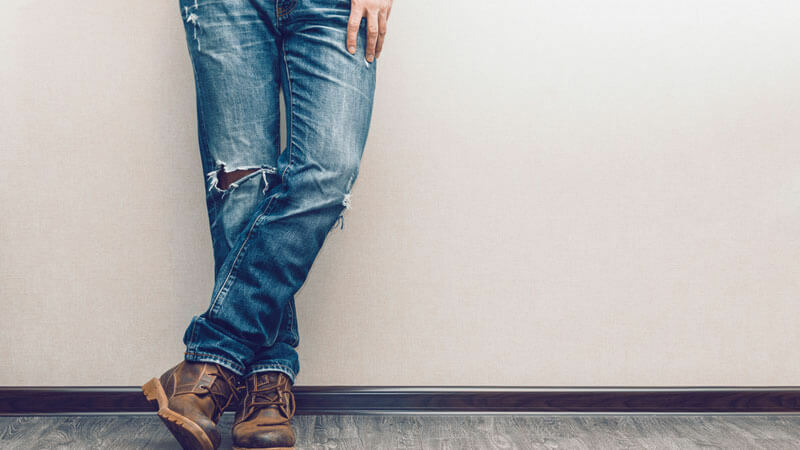 Most brands fall below the 2.5% PTAT average which suggests that they are not reaching enough people with their updates or the growth has lowered significantly. 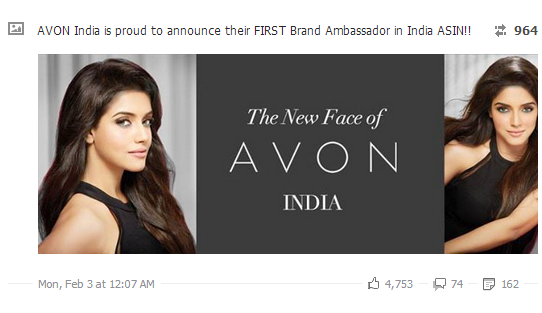 Avon India is placed much higher than the rest of the brands in these terms. Engagement scores are directly proportional to PTAT scores too, unless during a certain week a brand does more activities than the rest, during the study period. 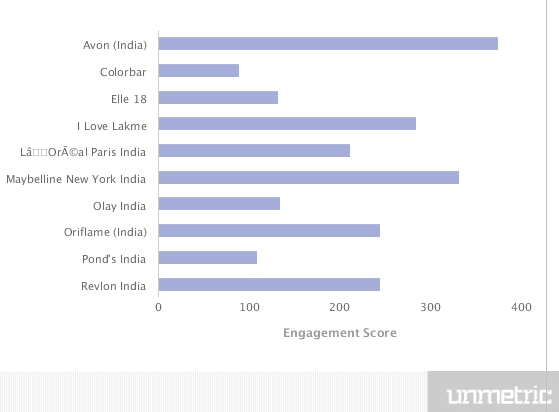 Avon India best engaged with its fans and has an engagement score of 375. Engagement scores are calculated taking into consideration the weighted averages of the responses to posts expressed as a percentage of the estimated number of impressions delivered. Responses are calculated by a weighted summation of the number of likes, the number of comments and the number of shares of the particular post. Followed by Avon India, Maybelline New York India scores 332, and is close to Lakme, which is at 285. 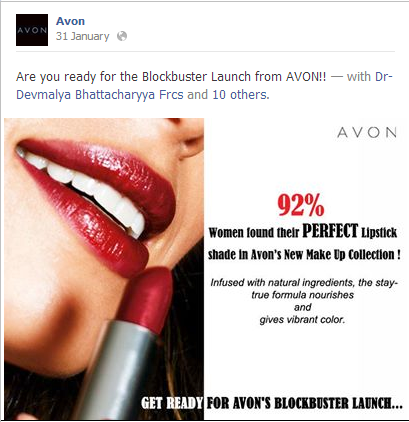 One of Avon India’s posts got the maximum engagement across all makeup brands. This was when they announced Asin as their brand ambassador. The post had an engagement score of 964. A very important metric to measure engagement is the likes, comments and shares received per post. 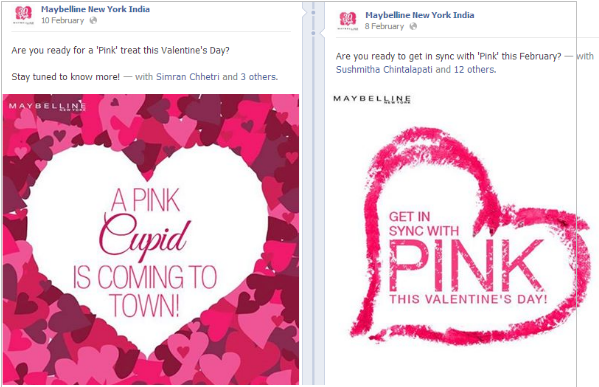 Maybelline India receives the highest number of engagement on an average which is 4,635 likes, 112 shares and 84 comments. 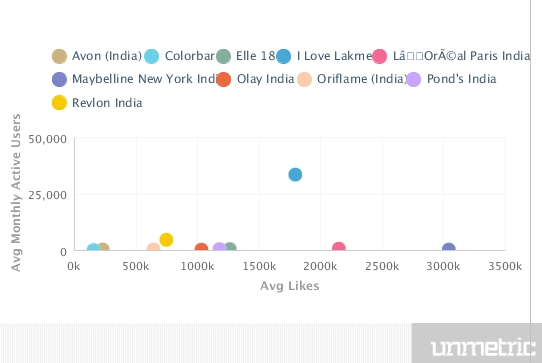 L’Oreal Paris and Lakme follow with an average of 1,852 and 2,486 likes, respectively. On Twitter, among the brand data available, L’Oreal Paris engaged best with followers at 380, closely beating Oriflame India at 369. L’Oreal Paris made 1,073 tweets which is about 11 tweets a day while Oriflame made 1,549 tweets which is 17 tweets a day on an average. This reinforces the fact that brands which are consistent and more active receive more engagement. Loreal Paris had the maximum number of replies too and was re-tweeted the most. It received 4 re-tweets per tweet, 4 replies and 1 favourite per tweet. However, this is low compared to the other sectors. 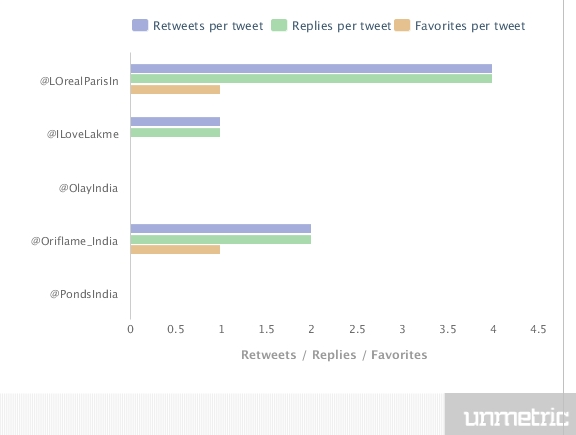 Olay India and Ponds India remained at the bottom of the charts with 0 retweets, replies and favourites. 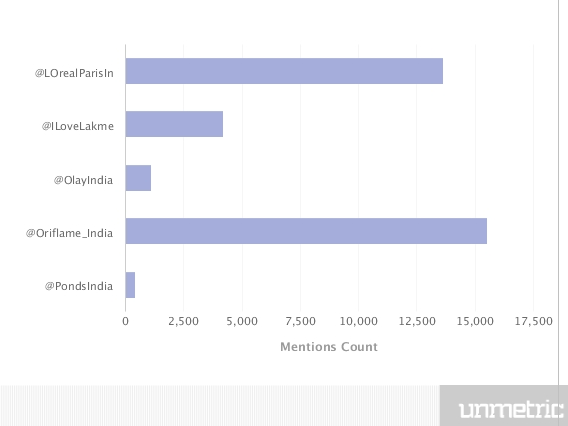 In terms of mentions, Oriflame India was mentioned the most while Ponds was mentioned the least. 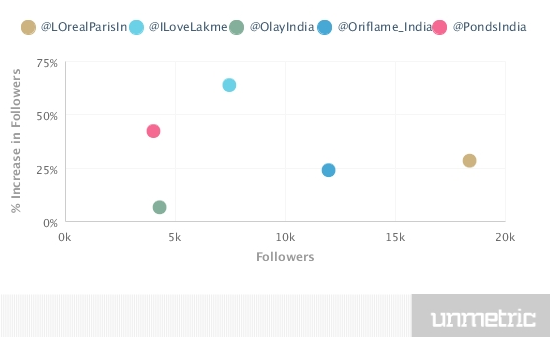 Oriflame India was mentioned more than 15K+ times and Loreal followed closely at 13K+ mentions. In comparison, Ponds was mentioned only 460 times. Makeup brands on social media should consider increasing the number of mentions through effective customer service. This strategy will help increase visibility on social media and help in better search results. The more the brands interact and respond to customer queries, the more will customers approach them on social media. Customer Service amid makeup brands is not that great. 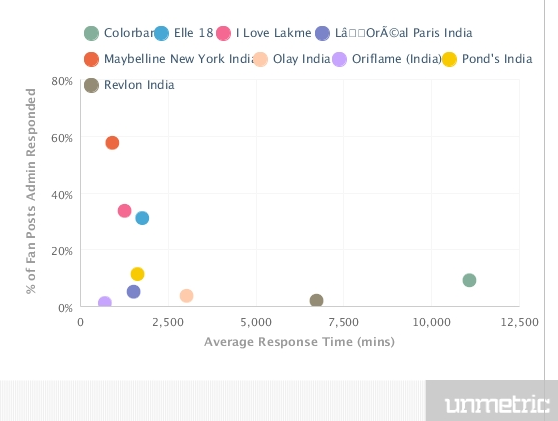 While Oriflame India has the best average response time of 11 hours, Maybelline has responded to 57.47% fan posts, which is the highest in this sector. The ART is extremely poor and the brands should consider revamping their customer service strategy on social media. 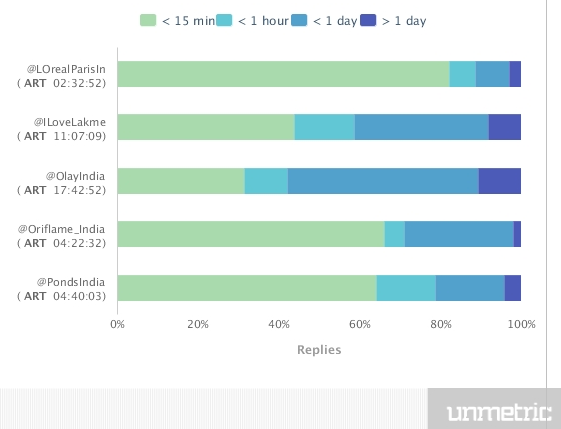 Colorbar takes upto 7 hours on an average to respond to customer queries on Facebook. Except for Maybelline, all brands respond to less than 40% of fan posts on an average. On Twitter, very few brands are actively involved in customer service. L’Oreal Paris has the best average response time (ART), that of 2 minutes and 32 seconds, for more than 80% of the posts. Therefore, as mentioned above, its mentions on Twitter are also very high. Oriflame and Ponds have an average ART of 4 minutes and a few extra seconds for more than 60% of the posts. Unfortunately, Olay does not understand the importance of customer service on Twitter. It is shocking to know that this otherwise leading brand takes upto 17 hours on Twitter to respond to a little over 20% of the posts. 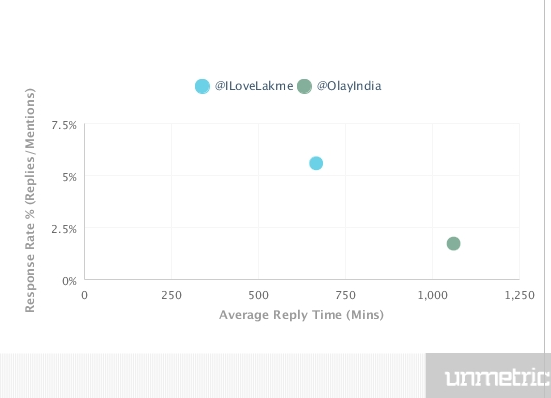 Lakme has the best average response rate and response time. Out of 4,225 mentions it has responded to over 231 posts. 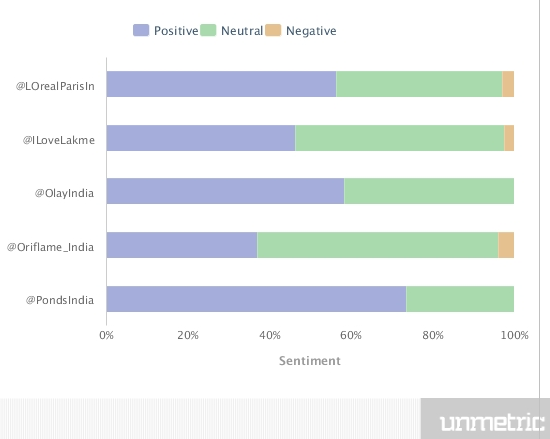 On Facebook, makeup brands have extremely less negative sentiment as compared to other sectors. 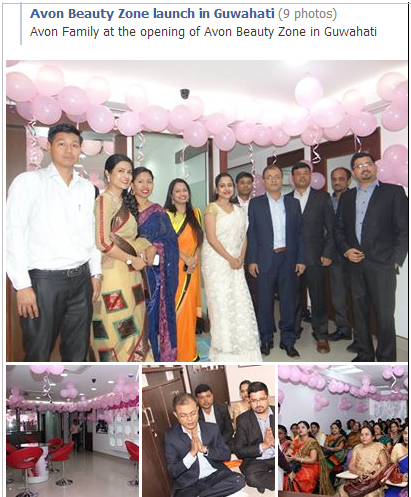 Oriflame India had the maximum number of positive sentiment, which is 369 out of 869 posts. However, when I did a month-wise analysis, Ponds India had the highest positive sentiment between 15th December and 15th January 2014. Oriflame, however, still had the most positive sentiment between 15th Nov- 15th Dec’ 13 and 15th Jan – 15th Feb ‘ 14. 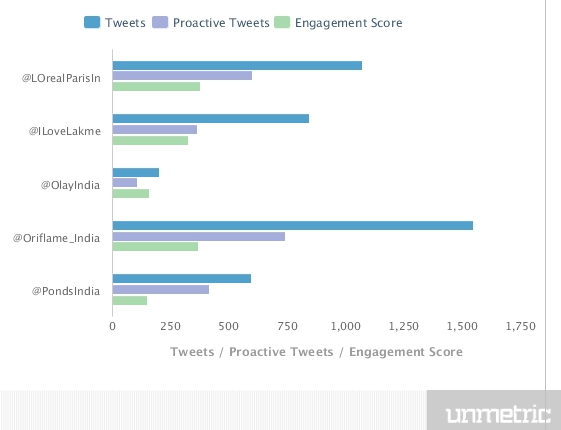 On Twitter, Ponds had the highest positive sentiment overall. 300 out of 408 tweets were positive. Loreal Paris had the most positive sentiment between 15th Nov – 15th Dec 2013. Post that, Ponds India took over as a lead. Makeup brands on social media are faring decently but can do a lot to increase their presence and optimize this medium, especially because their target audience is thriving here. Their overall strategy on social media is to garner eyeballs for their products and increase product awareness. These brands are hardly interested in customer support service and need to improve their CRM strategies.